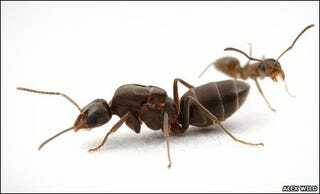 Ant colonies are often part of bigger "mega colonies" that share genetic traits and will not make war on each other. One colony got so big it now rivals the human population in its reach, covering most of the planet. In Europe, one vast colony of Argentine ants is thought to stretch for 6,000km (3,700 miles) along the Mediterranean coast, while another in the US, known as the "Californian large", extends over 900km (560 miles) along the coast of California. A third huge colony exists on the west coast of Japan. But it now appears that billions of Argentine ants around the world all actually belong to one single global mega-colony. Researchers in Japan and Spain led by Eiriki Sunamura of the University of Tokyo found that Argentine ants living in Europe, Japan and California shared a strikingly similar chemical profile of hydrocarbons on their cuticles . . . "The enormous extent of this population is paralleled only by human society," the researchers write in the journal Insect Sociaux, in which they report their findings. The real question is, do the ants have a plan?